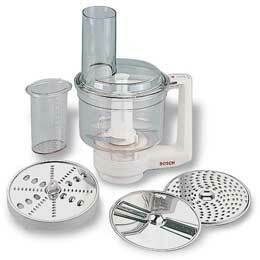 Designed to fit all Bosch stand mixer/kitchen machines whose model numbers begin with MUM 4 (Compact model), this food processor consists of a 5-cup work bowl with a cutting/mixing blade for chopping and mincing all manner of food, including meat, and for mixing liquids like soups and salad dressings. (The food processor has no motor and cannot operate independently of the kitchen machines.) Three stainless-steel disks are included. One disk slices cucumbers, cabbage, potatoes, and other vegetables. Another shreds carrots, celery, radishes, and other food. The third grates cheese, chocolate, nuts, and potatoes. The bowl is made of virtually unbreakable plastic, and parts disassemble easily for cleaning and are dishwasher-safe.